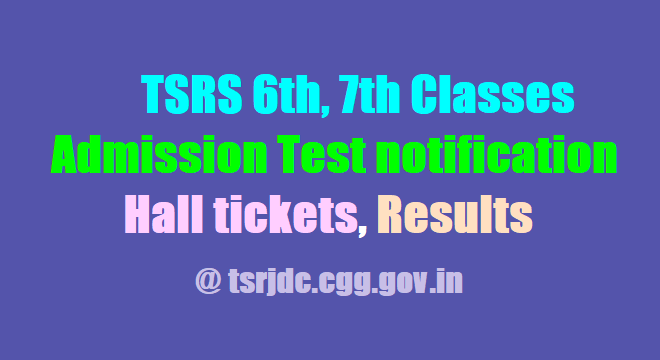 TSRS 6th,7th Classes Admission Test 2019, Hall tickets, Results @ tsrjdc.cgg.gov.in: / TS Residential Schools Entrance Test 2019/ TREIS TSRS 6th,7th Classes Admission Test 2019 Notification/ TSRS 6th,7th Classes Entrance Test 2019 Notification/TRIES VI, VII Classes Admissions 2019 Notification : TREI Society has decided to fill up the backlog vacancies in classes VI and VII for the academic year 2019-2020 in all 35 General Residential Schools District and also SC/ST backlog vacancies in 12 Minority Residential Schools through district level admission test. TREIS has issued the 6th and 7th Classes Admission Test 2019 notification for admission into above said residential schools and Telangana Residential Educational Society invites applications from the eligible students for admission into residential schools. The TREIS 6th and 7th Class admission test to be held in the month of June every year to fill up the backlog vacancies in classes VI & VII in all TSR Schools. i) Candidate must have studied Class-V for the whole of this year academic session in a Government/Government aided or other recognized schools. i) Candidate must have studied Class-VI for the whole of this year academic session in a Government/Government aided or other recognized schools. 3. The Student must have studied in Rural area (in case of OC/BC) for the vacancies in General Schools. For SC/ST this is not applicable. In case of vacancies in Minority Schools, Rural Area study shall not apply to all categories. 4. Nativity: Students must have studied in the concerned District during this year. 5. Selection: Selection Based on the merit in the Admission test and rule of reservation. i) For VI Class: SC / ST students should have born between 01.09.2005 to 31.08.2009 and OC / BC / SC-Converted Christians (BC-C) should have born between 01.09.2007 to 31.08.2009.
ii) For VII Class: SC / ST students should have born between 01.09.2004 to 31.08.2008 and OC / BC / SC-Converted Christians (BC-C) should have born between 01.09.2006 to 31.08.2008.
e) Date of Admission test for both classes: ...-06-2019. Eligible students may apply for this admission test on or before ..-06-2019.